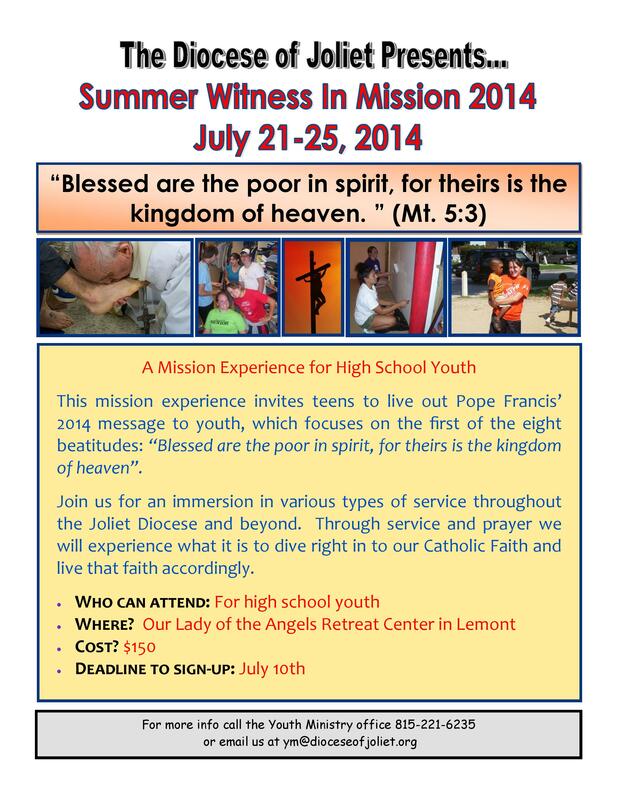 Who can attend Summer Witness In Mission? This mission program is open for students in grades 8-12 during the 2013-2014 school year. When and where is the Mission? The mission will take place from Monday evening, July 21 through Friday afternoon, July 25 at the Our Lady of the Angels Retreat Center (13900 Main St) in Lemont. Service projects will take place throughout the Diocese of Joliet and Chicago area. Students will be going to Feed My Starving Children in Aurora, Sacred Heart Mission in Hopkins Park, and a variety of other work places throughout the area. Exact sites and work to be done will be available at our Parent/Student meeting on Tuesday, July 15, 2014 at 7pm at the Our Lady of the Angels Retreat Center in Lemont. This is a required meeting. Times for the Mission Experience: Students should arrive at the by 6:30 PM on Monday for Check-in. Parents are welcome to stay for the prayer with all volunteers. Parents will return at 4:30 PM on Friday for closing prayer and a presentation by the teens. What is the cost of the Mission Experience? The total cost for each young person will be $150.00 This cost will include all meals, most of the supplies for the event and transportation. We will provide an extra supply list at the Parent/Student Information Meeting July 15. What students should bring: toiletry items, bible, work gloves, comfortable shoes, hat, water bottle, alarm clock, bug spray, sun screen, rain poncho/coat, and a snack to share with everyone! Additional details as to what to bring will be given at the Parent/Student meeting. Application and Permission Form: Each participant is asked to complete the application and permission forms by July 10, 2014. Cost is $150.00. Make check payable to the Diocese of Joliet, Office of Youth Ministry, 16555 Weber Rd., Crest Hill, IL 60403.